It’s been a very long time since I read anything by South African author André Brink (1935-2015): I think I discovered him at the library when he was shortlisted for the Booker for the second time with Rumours of Rain (1978). (An Instant in the Wind was shortlisted in 1975). I remember reading four or five of his books, and although I didn’t keep a journal in those days, I still vividly remember The Other Side of Silence (1982). Brink was a great writer, passionate and fearless about exposing apartheid to the world, and remarkable as a bilingual author, writing his novels simultaneously in both Afrikaans and in English. 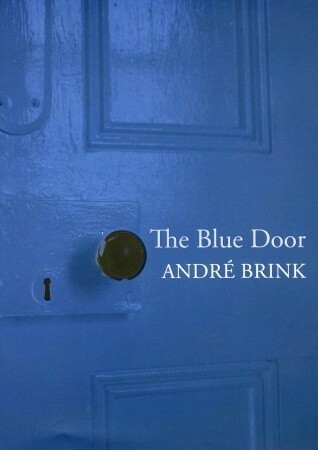 The Blue Door is, however, not a novel: it’s a slim novella of only 122 tantalising pages. It asks the question what if… what if reality suddenly shifts and everything that is familiar no longer exists. In the course of the story Brink references Gregor Samsa in Kafka’s Metamorphoses and Haruki Murakami’s Sputnik Sweetheart and what happens to David Le Roux is somewhat similar. When he lies in bed with a wife called Sarah who he’s never seen before, she is reading Murakami’s novel and ponders Miu’s disorientating experience of shifting dimensions, changing places with herself. David, since he stepped inside the blue door, has been confronted not only by Sarah, but also two children that he has apparently fathered and who expect him to tell him the usual bedtime story – a fairy story that happens to allude to very similar circumstances to his own situation. And because this is a South African story, issues of colour surface. David’s wife Lydia is White, and so is he. His wife in the new reality, Sarah, is Black, and only a few years ago, their ‘marriage’ would have landed them in gaol. As he lies awake in bed he remembers an aborted relationship with a smart, sassy Black woman called Embath, a woman who captivated him and saved him from drifting into marriage with a childhood sweetheart. With artful precision, Brink shows us exactly what Nelia is, damning her with a single word when she stumbles in on Embath and David together, and she shrieks in a high-pitched voice, ‘with a meid, David, with a meid?’ He moved on after that, and married Lydia, but he has never forgotten Embath and what might have been. Torn between loyalty to his predictable wife Lydia and the sensuous charms of an uncertain future with Sarah, David tries to find his way back but finds that the past is gone. His memories are unchanged, but they don’t help him to negotiate a way forward in a world where he does not know anything about Sarah or how they come to be sharing a life together. Is the past an illusion, or is the present an hallucination? The Blue Door a very powerful metaphor for the transition from apartheid to the new South Africa. How interesting. I have a few Brinks picked up in charity shops over the years but have never read him. I foolishly thought he was French! Well, with a name like Andre, you would! I’m sorry you’re not sleeping Lisa but you’re bringing us some fascinating books. My phone’s been mostly off for 36 hours and is now full of posts I have no time to read. I will follow up Brink but also Murukami of whom Ihave only listened to 1Q84. BTW having too much to read is a good thing. I’m sure I’ll have a (vehicle) breakdown or night off soon and get time to catch up. Not to worry about the insomnia, it doesn’t matter like it used to when I was making my way to work on 2-3 hours sleep! I hope you do get a night off, your working hours sound crazy – and maybe a bit risky? Take care, please!